"I actually learned this in the kitchen of this lovely Indian woman! Serve hot in soup bowls, or over rice." Rinse the dal, checking for any debris; add to saucepan with 2 1/2 cups water. Allow to soak for 30 minutes. Bring dal, water, and salt to a boil. Reduce heat to medium-low and cook until beans are very tender and mixture has thickened, 15 to 20 minutes. Add more water, if necessary, to prevent drying out. Stir in ginger, jalapeno pepper, tomato, lemon juice, and turmeric. Heat oil in a small saucepan and add cumin seed and red chile pepper. When pepper is heated, add Asafoetida powder and garlic. Stir mixture into split peas and add cilantro; mix well. 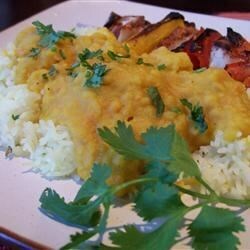 You can use yellow split peas instead of moong beans, but I don't think they're as nice. Just FYI - If the dried yellow split peas are round, they're "chana dal". Moong dal is smaller and more oval-shaped. Very good, easy recipe. I omitted the "1 pinch Asafoetida"